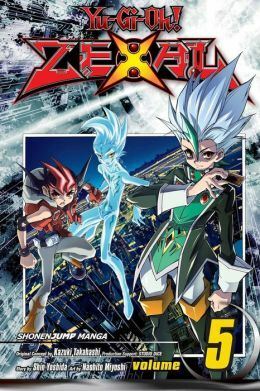 Yu-Gi-Oh Zexal Volume 5 cover image is courtesy of barnesandnoble.com. In the Yu-Gi-Oh! franchise, Yu-Gi-Oh! Zexal follows Yu-Gi-Oh! 5D’s. Zexal is set in futuristic Heartland City. It focuses on Yuma Tsukumo, a hot-bloodied young duelist who wants to become Duel Champion. Yuma is accompanied by Astral, a mysterious spirit that only Yuma can see. Together, they search for Numbers, special cards that hold Astral’s memories and are also highly sought after. Kyogi Yaguma declared the start of the Numbers Wars. As Yu-Gi-Oh! Zexal, Vol. 5 (Line World! !, Chapters 25 to 30) opens, Yaguma successfully kidnaps, Haruto, the younger brother of the mysterious and taciturn young Numbers Hunter, Kaito Tenjo. Kaito is ready to duel Yaguma for his brother, but Yaguma has masked duelist, Hishakaku, fight in his stead. Meanwhile, Yuma tries to find a way to make an ally of Kaito, who considers Yuma an enemy. Perhaps, a duel between Kaito and Ryoga Kamishiro a/k/a “Shark” will open up an opportunity to form an alliance. Also, Shadow seemingly knows all. THE LOWDOWN: I have previously described the Yu-Gi-Oh! Zexal manga as the most kid-oriented Yu-Gi-Oh! manga I’ve read. While still kid-friendly, Yu-Gi-Oh! Zexal Volume 5 is darker because the duels seem personal as much as they are about obtaining Numbers cards. I get the impression some want to spill the blood of others. I find Vol. 5 to lack the spark of adventure and discovery that I found in previous volumes. It focuses mostly on Kaito Tenjo, a character who is belligerent in his lone wolf attitude, so reading about him isn’t as fun as say reading about the perky lead, Yuma Tsukumo. Shadow, an emerging adversary, however, hints at being a likeable bad guy. POSSIBLE AUDIENCE: Anyone who has been reading the other Yu-Gi-Oh! manga series may want to try the Shonen Jump title, Yu-Gi-Oh! Zexal.